Just how much does Caribbean University - Carolina ask for tuition at this time, and how much is tuition expected to change? How does this compare to other schools? Keep reading to find out. Be prepared economically for your education. Compare Caribbean University - Carolina's tuition and fees to U.S. colleges and universities. Check for tuition tendencies and potential increases to see if you have to allocate more money for the next four years of college bills. How Does Caribbean University - Carolina Contrast With Other Schools? The next table outlines how Caribbean University - Carolina measures up to other schools nationally, regionally and by state. How Much Will Tuition & Fees Be for Caribbean University - Carolina? In the 2017 - 2018 school year, regular students at Caribbean University - Carolina were billed $5,264, prior to corrections for financial need. Of that number, the cost of tuition came to $4,464. $800 was fees. In contrast to public colleges, Caribbean University - Carolina does not offer a tuition discount to residents of the state. Tuition and fees cover the cost of attendance for one academic year, but don't include room and board, which will be an added bill you will incur if you live on campus. Having said that, many students will end up spending under full tuition because they qualify for financial aid as well as other rate reductions. See Caribbean University - Carolina cost per credit hour here. There has been an increase of 1.6% in Caribbean University - Carolina fees and tuition for out-of-state students in the past 5 years. Tuition expanded by 1.7% and fees expanded by 1.3%. This year, undergrads should anticipate paying $5,349 if the growth keeps up. Due to price increases, the full cost of a four-year degree will be $21,917, and the full cost of a two-year degree would be $10,784, which doesn't include additional charges such as books, transportation, and room and board. 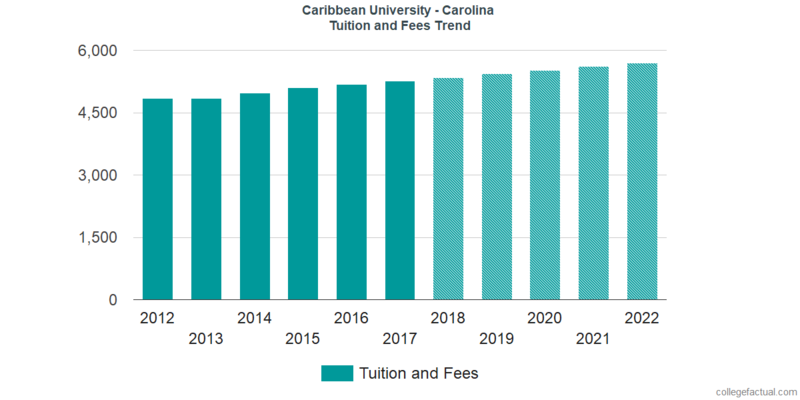 See this next chart to find out how Caribbean University - Carolina fees and tuition may develop in the future. Mainly due to inflation as well as other variables, the price of college has a tendency to increase every year. For this reason your final year of college could be much more expensive than your first year.